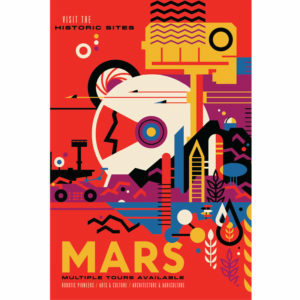 These imaginative space travel poster designs were recently made available to the public by NASA/JPL. Earth: There's no place like home. 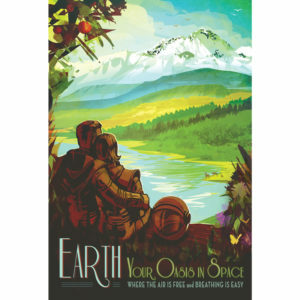 Warm, wet and with an atmosphere that's just right, Earth is the only place we know of with life – and lots of it. JPL's Earth science missions monitor our home planet and how it's changing so it can continue to provide a safe haven as we reach deeper into the cosmos. Contact us if you'd like the poster in another size, or if you'd like it matted and framed. 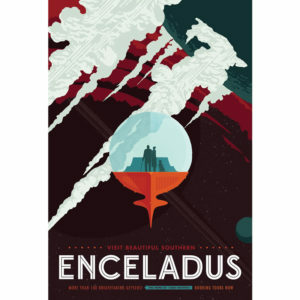 Enceladus: The discovery of Enceladus' icy jets and their role in creating Saturn's E-ring is one of the top findings of the Cassini mission to Saturn. Further Cassini mission discoveries revealed strong evidence of a global ocean and the first signs of potential hydrothermal activity beyond Earth – making this tiny Saturnian moon one of the leading locations in the search for possible life beyond Earth. 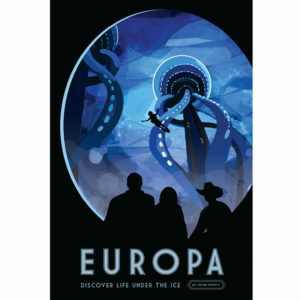 Europa – Discover Life Under The Ice: Astonishing geology and the potential to host the conditions for simple life make Jupiter's moon Europa a fascinating destination for future exploration. Beneath its icy surface, Europa is believed to conceal a global ocean of salty liquid water twice the volume of Earth's oceans. Tugging and flexing from Jupiter's gravity generates enough heat to keep the ocean from freezing. On Earth, wherever we find water, we find life. What will NASA's Europa mission find when it heads for this intriguing moon in the 2020s. 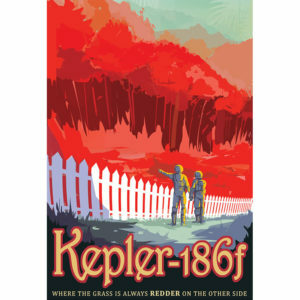 Kepler 186f – Where the Grass is Always Redder: Kepler-186f is the first Earth-size planet discovered in the potentially 'habitable zone' around another star, where liquid water could exist on the planet's surface. Its star is much cooler and redder than our Sun. If plant life does exist on a planet like Kepler-186f, its photosynthesis could have been influenced by the star's red-wavelength photons, making for a color palette that's very different than the greens on Earth. This discovery was made by Kepler, NASA's planet hunting telescope. Contact us if you’d like the poster in another size, or if you’d like it matted and framed. 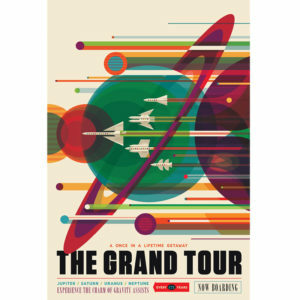 The Grand Tour: NASA’s Voyager mission took advantage of a once-every-175-year alignment of the outer planets for a grand tour of the solar system. The twin spacecraft revealed details about Jupiter, Saturn, Uranus and Neptune – using each planet’s gravity to send them on to the next destination. Voyager set the stage for such ambitious orbiter missions as Galileo to Jupiter and Cassini to Saturn. Today both Voyager spacecraft continue to return valuable science from the far reaches of our solar system. Contact us if you’d like the poster in smaller size, or if you’d like it matted and framed.